A Junk-Foodaholic's Journey to a Healthy Lifestyle: Starting Something New! This week has really gone by quick for me. Part of it is because for the last two nights, I've fallen asleep around 8 o'clock putting my baby down for the night. I'm usually a night owl so it's been weird getting so much sleep. Of course, I need the sleep with Brady waking four to five times every night for the last two months! Our little man used to sleep through the night - oh, but those were the good ole' days! 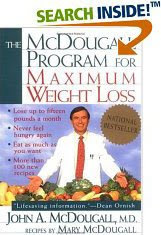 I started The McDougall Program for Maximum Weight Loss a couple of days ago. Dr. McDougall claims I can lose a half pound per day eating as much as I want, as often as I want, and never feel hungry again. Sounds good doesn't it? My husband, Paul, has had the book for a long time and we've decided to do it as a family. It's a healthy program consisting of a starch-centered diet, coupled with moderate exercise, and one that we can follow for the rest of our lives. The information in this book is all new to me because I've never heard you could lose weight eating a diet centered around starches (rice, potatoes, sweet potatoes, and legumes). In fact, I've always been told and believed the opposite. 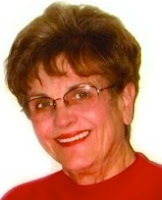 Read McDougall's Newsletter explaining why worldwide, trim people eat carbohydrates. A study of 574 people who have attended McDougall's live-in program at St. Helena Hospital in Napa Valley, California, shows that in just eleven days overweight men (weighing more than 200 pounds) lose on the average of 8.3 pounds - that's almost a pound a day! Overweight women (who weigh more than 150 pounds) lose, on average, 4.4 pounds in those eleven days. The people who follow the program lose between 6 and 15 pounds a month, until they approach trim body weight. Most important, these results are attained by eating to the full satisfaction of their hunger drive. Everyone is encouraged to return for seconds, and thirds, if they like. They are cautioned not to remain hungry. The book contains over 100 recipes and there are many more recipes available through his website. There are quite a few that I want to try. I'm excited about this program! I will, of course, keep you posted.